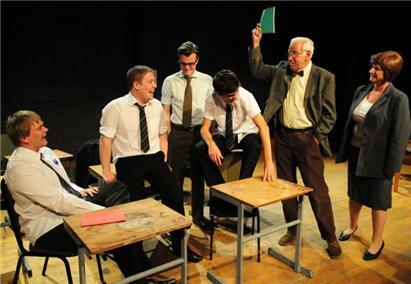 ALAN Bennett’s The History Boys, a play set in the early 1980s, is about a group of boisterous and gifted teenage boys, eccentric teachers, a pushy headmaster, sexual revelations and the perils of applying for Oxbridge. The redTIE Theatre production at Quay Arts, directed by Helen Reading and Joe Plumb, opens with a soundtrack of 80s electronica, as the small stage fills with bustling boys, followed by Rod Jones’s Hector, a tired old English teacher with a secret. From the offset, the cluster of male students captivated all attention from the packed audience, radiating excitement and energy as they fired out Bennett’s witty repartee. Ben Curtis’s portrayal of joker Timms and Joel Fitzpatrick’s supremely confident Dakin were particularly compelling. The small theatre made clever use of the stage, separating it into distinct areas, with the lighting flicking swiftly between them. Characters plunged into semi-darkness remained in sight, becoming part of a living set. The staff room was the setting for the teachers’ cynicism about the future lives and careers of their charges, as well as their own. Fiona Gwinnett’s droll history teacher, Mrs Lintott, provided much comic relief during a feminist rant and a bout of emphatic swearing. The sexual elements of Bennett’s play began with the character of Dakin’s updates on his relationship with the headmaster’s secretary, followed by one boy’s obsession with another, a teacher’s urge and Dakin’s need to experiment. The tense and difficult sexual plots were dealt with confidently by the young actors and mildly awkwardly by the teachers. The talented young actors, teachers, ranging from Steve Reading’s hysterical headmaster to Dan Trevenna’s mild, secretive Irwin, and the poignantly played out ending, all went to make this production of Bennett’s famous stage play extremely enjoyable. 18th & 19th September 2012, Quay Arts, Newport. Boys: Bradlet Tutt, Andrew Butcher, Adam Doggett, Joel Fitzpatrick, Benny Curtis, Bill Holland, Robert Selby.